A REMINDER; TONIGHT AT 7 P.M. ON THE CAPITOL SQUARE DOWNTOWN, THE WISCONSIN CHAMBER ORCHESTRA WILL PERFORM THE POSTPONED CONCERT ON THE SQUARE OF ALL-AMERICAN COMPOSERS THAT IT WAS ORIGINALLY SCHEDULED TO PERFORM LAST NIGHT. THE PROGRAM INCLUDES THE SECOND PERFORMANCE OF MADISON COMPOSER JOHN STEVENS’ ‘FANFARE FOR AN UNCOMMON MAN,’ WRITTEN TO HONOR WISCONISN YOUTH SYMPHONY ORCHESTRAS (WYSO) FOUNDER MARVIN RABIN. YOU CAN READ MORE ABOUT IT BY LOOKING AT YESTERDAY’S POSTING. This is one of those “Catch Up” postings that I meant to put up earlier. But technical issues and other things, including personal commitments and the wealth of live classical music events to keep up with in the Madison area, delayed it. I hope you still find it enjoyable and informative as I did. AND I extend my apologies for the delay to you and to the guest blogger. MSO violist Jasmine Beams was also among the 101 musicians to play with the YouTube Symphony Orchestra 2011, made up of musicians chosen through online auditions from across the world. 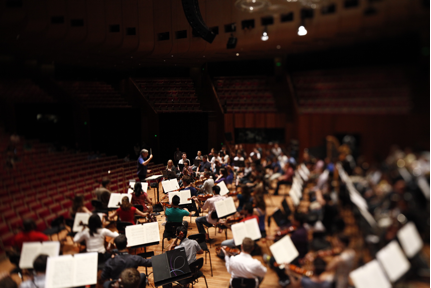 They were flown to Sydney in March for a week of rehearsals followed by a performance, VIEWED BY OVER ONE MILLION ON THE WEB, at the Sydney Opera House. Last December, I auditioned for the 2011 YouTube Symphony Orchestra. I submitted an audition video on YouTube, and after a committee of musicians from various orchestras around the world selected me as a finalist, my video was released to the Internet at large for anybody who happened to stumble across it to vote for me. I won enough votes to make it into the orchestra, and in March, I traveled across the world to sunny, summery Sydney, Australia, for one week of intensive rehearsals, engaging coaching, and, of course, some sightseeing and downtime in an incredible city. Most of us first arrived in Sydney early in the morning, and since our hotel rooms weren’t available to check into yet, we headed straight onto a boat cruise of the Sydney Harbor. 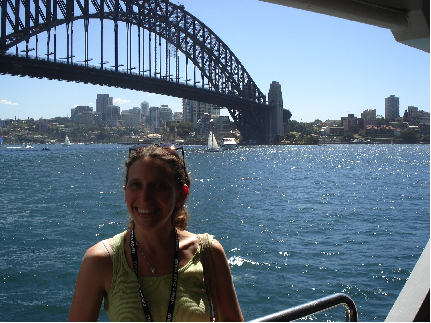 Here I am on the boat with the Sydney Harbor Bridge in the background. That night we took a tour of the opera house and had a chance to see most of its many halls and theaters. Although the main hall of the opera house is not acoustically ideal, it is incredibly beautiful and the organ is absolutely magnificent (one of the largest in the world—it took 10 years to build and install). The next day, we had our first rehearsal. Honestly speaking, it was pretty rocky. And how could it not be? There were 101 musicians from 33 different countries, all with completely different playing styles and completely different levels of orchestral experience. Michael Tilson Thomas was incredibly patient though, and although we had a long way to go, the hard work paid off in the end. Each section had a coach who came from a different prestigious orchestra around the world. 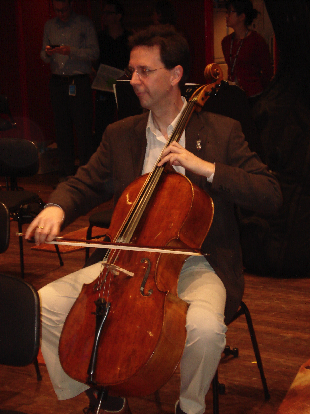 The cello coach was Tamas Varga, principal cellist of the Vienna Philharmonic. Tamas was an incredible teacher and an extremely kind person. He helped bring us together as a section, musically and personally, and gave us an inspiring coaching on the slow movement of Villa-Lobos’ Bachianas Brasileiras No. 1, which we decided to perform for Open Mic Night at the Basement Bar in Sydney. This is Tamas, warming up before a rehearsal. One of the incredible things about being a part of the YouTube Symphony Orchestra was the unbelievable royal treatment we received from Google and YouTube. Besides having all of our travel expenses paid, we were put up in single rooms at the Four Seasons Hotel right on the Sydney Harbor, given complimentary Nexus S Android phones, and offered incredible opportunities that would have been hard to come by if we were just in Sydney as tourists. 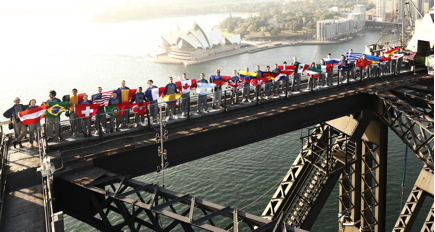 One such opportunity was the chance to climb the Sydney Harbor Bridge, which we did at sunrise one morning. Once we got to the top of the bridge, we were each given a flag for each of the countries represented in the YTSO, and we had a mini-photo shoot atop of the bridge. If you look in the background of this picture, you’ll see the Sydney Opera House behind us. The grand finale concert was incredible, musically and technologically. I had never been a part of an orchestra that had come so far so fast. In just one week, the orchestra actually sounded as if we had all been playing together for years. 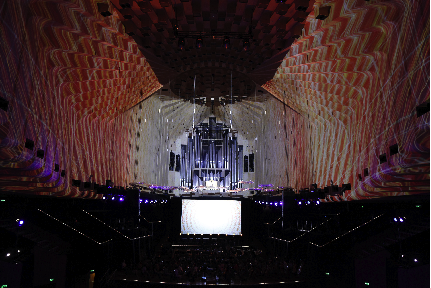 Intricate lighting, videos and projections filled the inside of the concert hall as well as the outside “sails” of the Opera House. It was a true technological spectacle. Both the music and the technology enhanced each other and made for an even richer experience for the audience—inside the hall, outside the Opera House, and on the Internet. All in all, the YTSO experience was something that I would not have traded for anything. I met some really wonderful people, saw some amazing sights, and performed in a concert that truly propelled classical music forward in our rapidly changing world.